Hewlett Packard - 354588-B21 HP DL360 G4 1.44MB FLOPPY DRIVE PN: 354588-B21. 361402-001. Hewlett Packard - 679368-001 679368-001 HP 1U Small Form Factor Ball Bearing Rail Kit For Proliant Dl360p Gen8. New Bulk Pack. Hewlett Packard - ProLiant DL360 G7 HP ProLiant DL360 G7 2x HexaCore Intel Xeon E5649 2.53/2.9GHz 24GB (6x4GB) DDR3 RAM ATI ES1000 RN50 4-Bay 2x 72GB/2x 500GB Hard Drives Smart Array P410i RAID controller DVD/DVD±RW 2x 460 Watt Redundant PSU 1U Rack Server. Hewlett Packard - 161219-001 HP/COMPAQ-PROLIANT DL360 G1-1 X PIII 550MHZ 128MB RAM ULTRA2 WIDE SCSI 24X CD-ROM FDD 10/100 NIC 1U RACK SERVER (161219-001). RENEWED. IN STOCK. SHIP SAME DAY. Hewlett Packard - U4506E U4506E HP Installation Service Installation Configuration For Cloud System Central Management Kit For Proliant BL460C Gen8 DL360 Gen9 DL360P Gen8 Server. New Retail Factory Sealed With Full Manufacturer Warranty. Hewlett Packard - 504636-001 504636-001 HP Proliant Dl360 G6 1x Xeon Qc 2.26GHz 8MB 4GB Ram SAS Gigabit Ethernet Rack Server. New Bulk Pack. Hewlett Packard - 633776-001 633776-001 HP Proliant DL360 G7 1x Intel Xeon Qc E5649 2.53GHz 6GB Ram SAS SATA 2x HP NC382I Gigabit Ethernet 1u Rack Server. New Bulk Pack. Hewlett Packard - 378705-001 HP/COMPAQ-PROLIANT DL360 G4P - 2X XEON 3.6GHZ 2GB RAM ULTRA320 SCSI 24X CD-ROM FDD GIGABIT ETHERNET ILO 1U RACK SERVER (378705-001). REFURBISHED. IN STOCK. SHIP SAME DAY. 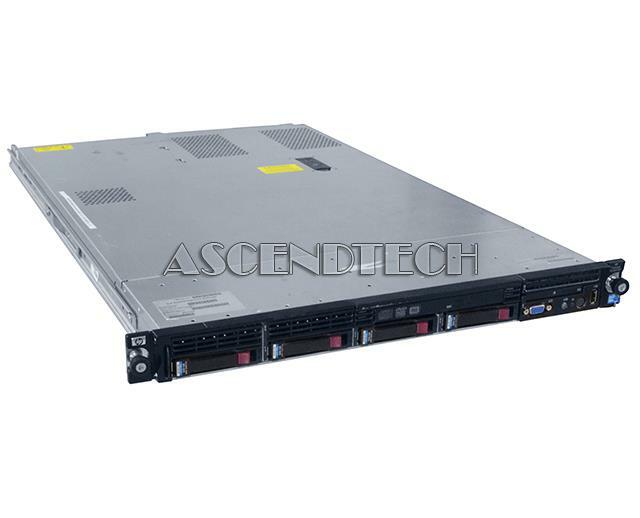 Hewlett Packard - 459959-005 459959-005 HP Proliant DL360 G5 S BUY 1P Xeon E5420 QC 2.5GHz 2GB RAM SAS SATA Smart Array P400I 256MB 2X HP NC373I Gigabit Ethernet 6SFF 1X 700W 1U Rack Server. New Bulk Pack. Hewlett Packard - 457924-001 457924-001 HP ProlianT DL360 G5 Base Model 1X Intel Xeon QC E5430 2.66GHz 2GB RAM NC373I Multifunction Gigabit Adapter Smart Array P400I 256MB 6SFF 1X 700W PS 1U Rack Server. New Bulk Pack. Hewlett Packard - 459961-005 459961-005 HP Proliant DL360 G5 S Buy 1X Xeon E5440 QC 2.83GHz 2GB RAM Smart Array P400I With 256MB BBWC SAS SATA HS 2X HP NC373I Gigabit Ethernet 4SFF 2X 700W 1U Rack Server. New Bulk Pack. Hewlett Packard - 661190-B21 661190-B21 HP Proliant DL360E G8 Cto Chassis With No CPU No RAM 4-LFF HDD Bays HP Ethernet 1GB 4-Port 366I Adapter HP Dynamic Smart Array B120I Controller 1U Rack Server. New Bulk Pack. Hewlett Packard - 579242-001 579242-001 HP Proliant Dl360 G7 1x Intel Xeon QC L5630 2.13GHZ 4GB RAM SAS SATA 2x HP NC382I Gigabit Ethernet 1u Rack Server. New Bulk Pack. Hewlett Packard - 430106-005 430106-005 HP Proliant Dl360 G5 1 X Intel Xeon 5120 DC 1.87GHz 2GB RAM SAS SATA HS Gigabit Ethernet S-Buy 1u Rack Server. New Retail Factory Sealed With Full Manufacturer Warranty. Hewlett Packard - U7RN8E U7RN8E HP Foundation Care 24x7 Service Extended Service Agreement Parts And Labor On Site 24x7 Response Time 4h For Proliant Dl360 Gen9 Server. New Retail Factory Sealed With Full Manufacturer Warranty. Hewlett Packard - 416560-001 HP/COMPAQ - PROLIANT DL360 G5 - 1P INTEL XEON 5120 DC 1.86GHZ 1GB RAM SAS/SATA HS GIGABIT ETHERNET 1U RACK SERVER (416560-001). REFURBISHED. IN STOCK. SHIP SAME DAY. Hewlett Packard - 416564-001 416564-001 HP Proliant Dl360 G5 High Performance 2P Intel Xeon 5150 DC 2.66GHZ 2GB RAM SAS SATA HS Combo 2X Gigabit Ethernet 1u Rack Server. New Retail Factory Sealed With Full Manufacturer Warranty.